I didn't particularly want to post 2 reviews from Manila back-to-back, and this time a sundae no less, but my streak of bad luck continues as I've made yet another trip without being able to review anything for this blog. On my last trip to Malaysia, they had the Prosperity Burger, (it returns every year) and the Groovy Lime McFlurry which made an appearance after almost a 4 year absence. The one interesting item I did find was a Reese's Peanut Butter Cup Cheesecake, but it was a McCafe item. 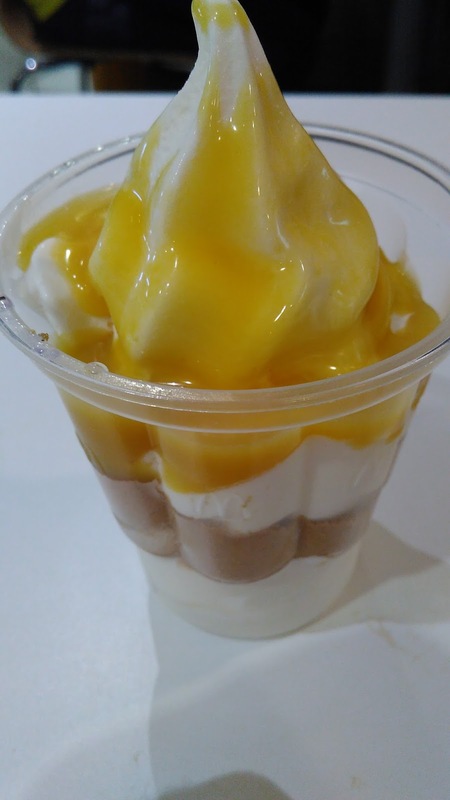 I still stand by my rule of not reviewing McCafe food, as I would never be able to eat elsewhere, and the items are usually just generic cafe snacks anyway. 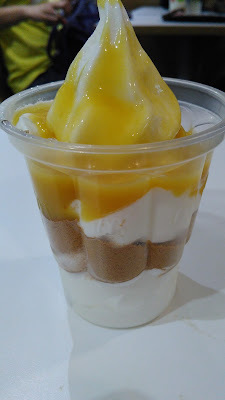 I actually tried this Banana Cream Pie Sundae, not on my last trip to Manila when I tried the Chicken ala King, but rather on a trip before that the night before I tried the Longgansia with Garlic Rice Breakfast. 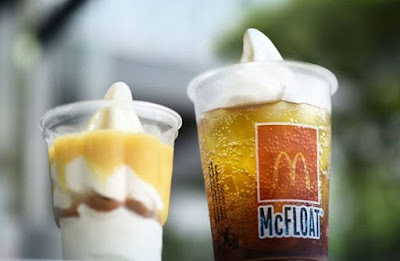 At the time, McDonald's Philippines was running a small "retro flavours" desert promo which included this sundae, but also a Rootbeer Float alongside the not-at-all-retro Banana Pie. Floats have never been that exciting for me, and the Banana Pie pops up elsewhere in Asia, so I went with the sundae, wfhich turned out to be a absolutely wonderful choice. 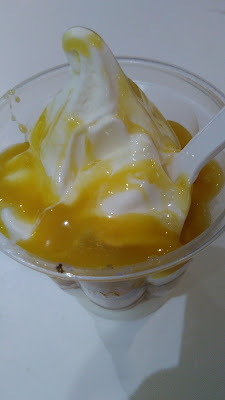 Long time readers will know that sundae reviews don't appear on this blog all that often. That's usually because any promotional sundae flavour usually has the same flavour served a McFlurry. I find the McFlurry quintessentially "McDonald's" so I usually go for that over the sundae. 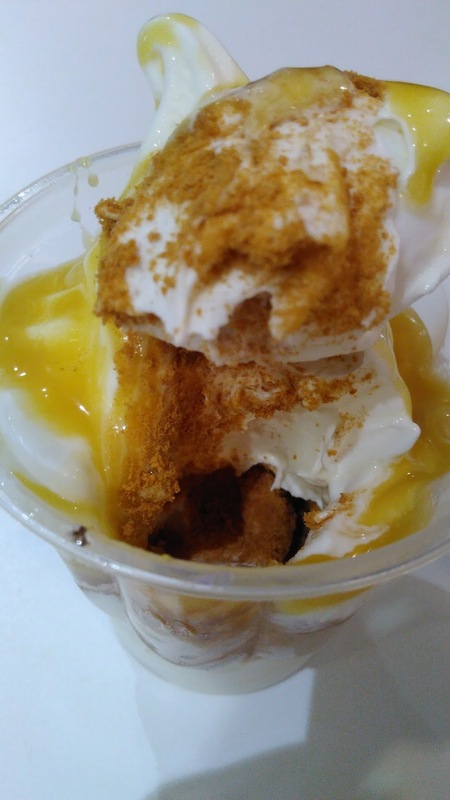 Not unexpectedly, the sundae wasn't topped with actual pieces of pie (and that's not as far fetched as it sounds), but rather only with 2 ingredients, Banana Cream Syrup, and Graham Cracker dust. The syrup was sticky and very sweet which in my opinion is usually a turnoff, but just as sweet as it was, it also had a deep banana flavour as well. It was also nice to find that it wasn't that bright artificial yellow colour many banana syrups are. Graham Crackers might sound completely disinteresting to western readers, but they are pretty much unheard of in most of Asia. Not sure if they are popular in the Philippines at all, but it was a very nice find for me. As expected they tasted just like graham crackers should, and the way they were ground up into a fine dust allowed them to be spread around the entire sundae. Combined together with the ice cream and banana syrup, it did in fact taste like a frozen Banana Cream Pie. I ordered the sundae expecting I would only eat a few bites, but this was one of the few ice cream dishes that I scraped my way to the bottom of the cup, and actually wanted more. An easy perfect score.